Andrew Roy Gibb was born on 5 March 1958, in Manchester, England, of part-Irish and Scottish descent. Andy was a singer, performer, songwriter – in fact a teen idol – but best known as the youngest brother of the Bee Gees, but never a member of the group. He became very popular in the 1970s with several successful singles, and all his efforts helped put his net worth to where it was prior to his passing in 1988. 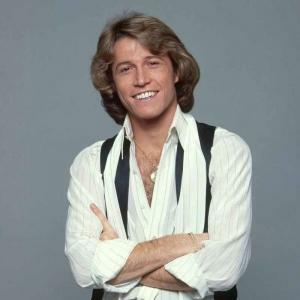 How rich was Andy Gibb? As of mid-2017, sources estimate a net worth that was at $10 million, mostly earned through a successful career in the music industry. One of his most successful songs was “Just Want to Be Your Everything”. However, his success was brief due partly to drug problems. Despite this, all of these achievements ensured the position of his wealth. Andy quit school at the age of 13, and began performing in tourist clubs around Ibiza, Spain as well as the Isle of Man. In 1974, he formed his first group entitled Melody Fayre which included Isle of Man musicians; the group was managed by Gibb’s mother and they had regular bookings. He composed several songs during this time, including “My Father Was a Rebel” and “Windows of My World”. He returned to Australia to where his brothers had migrated at their urging, since it was a good training ground for the Bee Gees. He created a demo called “To a Girl” and was working on an album which was never released. He continued making demos, and later joined the band Zenta as the vocalist – they supported international artists such as the Bay City Rollers and Sweet during their Australian tours. He performed the song “Can’t Stop Dancing” on the revitalized “Bandstand”, and the band Zenta would participate in Andy’s recording sessions. This would lead to his first single “Words and Music”. In 1976, he was noticed by RSO Records who signed him, and he moved to Miami Beach, Florida and started recording and producing songs. He made his first album “Flowing Rivers” and released his first single outside of Australia entitled “I Just Want to Be Your Everything”, which reached the top spot in the US, and became the most played song of the year. He re-recorded “Words and Music”, and released another top single in “(Love Is) Thicker Than Water” and then started working on his second album entitled “Shadow Dancing” which was released in 1978, reaching platinum status, and the title track would become the number one song of the year. He also released other Top Ten singles “An Everlasting Love” and “(Our Love) Don’t Throw It All Away”. The following year, he started performing with popular bands such as ABBA, the Bee Gees plus Olivia Newton-John, before in 1980 started working on what would be his final full studio album, entitled “After Dark”. In 1980, his last Top Ten single “Desire” charted – in his finale with his contract with RSO Records, he helped create “Andy Gibb’s Greatest Hits”. Andy performed less and got fewer opportunities due to cocaine binges. His family tried to help him by persuading him to stay at Betty Ford Center in the mid-1980s. He started touring once again, in small shows, and had guest appearances in sitcoms such as “Punky Brewster”. In 1987, he went through another drug rehabilitation program, and then got a recording contract for a new album. However, the deal never pushed through. For his personal life, it is known that Andy was married to Kim Reeder from 1976 to ’78, and they have a daughter. He also had a relationship with actress Victoria Principal but it ended due to his drug problems. In March 1988, he entered a stint of depression which led him to go to hospital in Oxford, England with chest pains, but he died, and it was later discovered that his heart was inflamed due to a viral infection. It was not the drugs that killed him directly, but years of alcohol and drug abuse. 1 I grew up in a show business family, so we've always had a great sense of balance, being so close to my parents. I've always known what is and isn't reality. Even my older brothers' early success 10 years ago didn't change me since there was such an age difference. 2 The most embarrassing thing for me was the day Bob Hope called me up and I was spaced out on cocaine. I was supposed to do his TV special, and I didn't turn up. Consequently, I was blacklisted by NBC for a long time. I damaged my career, and almost ruined my whole life. 3 Girls are always running through my mind. They don't dare walk. 4 I definitely have a sexual ego thing. But if I'm suggestive, it's in a nice way. Luckily, no one's ever been hurt...a few girls have passed out, that's all. 1 His father Hugh died on Andy's birthday in 1992 and 5 days before the fourth anniversary of Andy's death. 2 His daughter, Peta Gibb, was married on January 2008 to Matt Weber. 3 There is a song sung by his brothers, on the One Night Only album and DVD, dedicated to him. They sung it with some video footage of him on a screen at the back of the stage. Barry introduced it as a 'Song for Andy'. 4 Began playing at tourist clubs around Spain's coastal Island of Ibiza, and later back in his homeland of the Isle of Man, as a young teen. 5 Born in Manchester, England, to Hugh and Barbara Gibb, but was raised in Australia, moving there when he was six months old. The family settled in Redcliffe, Queensland, near Brisbane. 6 The idea of his joining The Bee Gees was often suggested, but the age gap between him and his elder brothers (more than 11 years younger than Barry, slightly more than eight years younger than twins Robin and Maurice) made this impossible. 7 Began recording a series of his own compositions, one of which was released as a single. "Words and Music" would eventually reach the Top Five on the Sydney music charts in 1976. 8 Separated from his wife by the time daughter Peta was born, and divorced later that year, he reportedly only met his daughter once in 1981. Peta grew up as Peta J. Reeder-Gibb and breeds Staffordshire Bull Terriers and judges dog shows in New South Wales, Australia. 9 In the United States, Andy became the first male solo artist to chart three consecutive Number One singles on the Billboard Hot 100. 10 Suffered from the "too much, too soon" pressures and excesses of such rapid teen idol success, he fell into a severe depressive state and tried to compensate by drinking, taking drugs and womanizing. 11 His extreme unreliability got him fired from not only the musical theater productions of "Joseph and the Amazing Technicolor Dreamcoat" and "The Pirates of Penzance", but also his popular co-hosting stint on Solid Gold (1980) in 1981. 12 Forced to declare bankruptcy in 1987. 13 Working on a new album in London in March of 1988, Andy was staying near Oxford, when on the morning of Thursday March 10th, he entered John Radcliffe Hospital, complaining of chest pains. He died the same day, just five days past his 30th birthday. His death from myocarditis (inflammation of the heart) was aggravated by his long abuse of cocaine, which fatally weakened his heart. 14 He was ranked #82 on VH1's 100 Sexiest Artists. 15 He was closest to oldest brother Barry than any other family member. Barry mentored him during his career , sang backup on many of songs, and even helped him write some of his songs. Barry claimed that the close bond of loyalty Andy had for him was returned, leading Barry himself to later comment "Andy and I were twins just as much as Robin and Maurcie were, in every sense of the word. We looked alike, we had similar moles, similar birthmarks, everything.". 16 The epitaph on his tombstone reads: "An Everlasting Love." 17 He was a licensed pilot. 18 Shortly before he turned 30, he and elder brother Barry Gibb fell into a "rather nasty" argument, which Barry deeply regrets to this day, since it was the last time he would see Andy alive. 19 He had three US number one hits by the time he was 21-years-old back-to-back. They were, "I Just Want To Be Your Everything," "(Love Is) Thicker Than Water," and "Shadow Dancing," which was number one for seven weeks in the summer of 1978. 20 Younger brother of Maurice Gibb, Robin Gibb and Barry Gibb. 21 Singer, brother to The Bee Gees. 22 Daughter, Peta (b. 1/25/1978). 23 Interred at Forest Lawn (Hollywood Hills), Los Angeles, California, USA, in the Court of Remembrance. Charlie's Angels: Full Throttle 2003 performer: "I Just Want To Be Your Everything"
My Own Private Oshawa 2002 TV Special performer: "Shadow Dancing" / writer: "Shadow Dancing"
Olivia Newton-John: Hollywood Nights 1980 TV Special performer: "I Can't Help It", "Oh Boy! ", "Heartache Tonight"
Solid Gold 1980 TV Series performer: "Solid Gold Theme"
The Music for UNICEF Concert: A Gift of Song 1979 TV Special performer: "I Go Fo You", "Rest Your Love On Me", "Put A Little Love In Your Heart" / writer: "I Go Fo You"
Olivia 1978 TV Special performer: " Remember The Days Of Old Schoolyard", "If You Love Me Let Me Know", "Love Is Thicker Than Water", "Shadow Dancing", "If You Love Me Let Me Know" reprise, "Barbara Ann", "Jaihouse Rock", "Holiday", "Thank You For The Music"
The Music for UNICEF Concert: A Gift of Song 1979 TV Special Song Performer "I Go For You" and "Rest Your Love On Me"